The sky is the color of sherbet, boys are throwing baseballs and the ice cream truck can only be a few blocks away because already I’m humming along to Joplin’s “The Entertainer.” But forget the truck. I’m sitting on my Sackett Street stoop anxiously waiting for Dad to come home from work. Mom says that when Dad gets home, we can get ices. Where is he? Around 8 p.m. on an icy weekday night, I am following co-owner, Gasper Zerilli, 62, to the back of his shop, and into the kitchen. Steve Miller Band is playing loudly on the radio, but Zerilli does not turn it down. Instead, he does a quick wipe of his hands down the front of his flour-dusted apron and gets right into it. And we all start somewhere. Surely, a valuable skill in the baking business, but what Salvatore really wanted to do was master the pastries a baker’s “uncle” could be proud of. 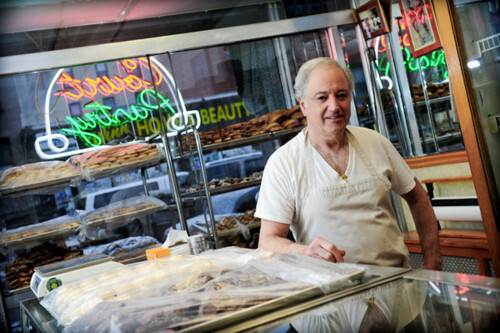 So he went to work for an older man named Mr. DeBella who owned a pastry shop on Avenue U and West 5th Street in Gravesend, Brooklyn. And it makes a difference. In fact, it inspires you to get in touch with your friend, Anthony Caraciolla, during the summer of 1948, and open up your own shop in Cobble Hill. Today, in the back, we have Gasper, Vincent, two bakers and a kid who comes in on weekends. In the front? Girls. “So the recipes are pretty much the same. I may have added some pies and cheesecake to the mix, but the cannolis are the same, the sfogliatelles are the same,” Gasper says. All of a sudden, it’s hard to concentrate. I’m glad the conversation began in the kitchen because now we’re up front and I’m distracted. Seven-layer cookies, stacked like adorable, little birthday presents. Deep almond and apricot flavors accentuated by a pencil-thin layer of chocolate on top and bottom (obviously my favorite). Macaroons. Cuccidati. Rococo. Chocolate things. Can I be another girl that works here? Please? The wall is lined with prices. 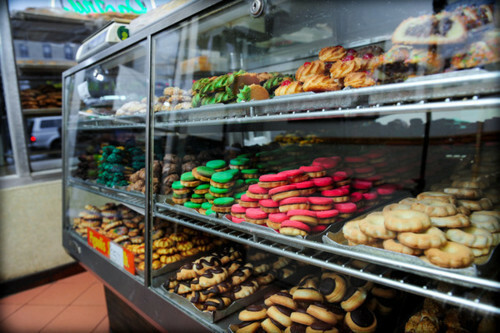 $11/lb for the mixed cookies/sugar free cookies; $6.50/lb for the regina and twist cookies; $2.25/pastry; $2.75/sfogliatelle. If you want 21 pastries, the price is up there. And for good reason. 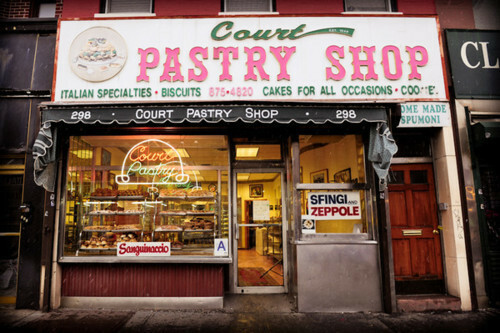 Trust me, your brain can’t compute math when you’re at Court Pastry.